So why is it so hard to make a decent Superman film? Superman and Superman II remain the gold standard, despite having dated effects and being about Pre-Crisis Supes. I actually enjoyed Superman Returns, but I can see why it wasn't a big hit at the box office. In terms of the Warner Premiere animations, Superman Vs The Elite, All-Star Superman and Superman: Doomsday all tell decent stories and portray the Man of Steel properly. So why is it so hard? The Big Blue Boy Scout has been around more than seventy years at this point, surely modern film-making techniques can do better? I've been pondering this notion since I saw Dawn of Justice actually, where, once again, Batman fit the world perfectly (aside from all the murders, but that's another story) but Superman, even in his own sequel, was an outsider who just didn't seem to know where he belonged. Yes, part of Superman's story is born of the American immigrant experience, so the whole "You look like one of them, but you aren't one of them" thing works, but there's no point if it's not going to be a major theme. I've watched almost every Superman film now, and I've noticed a few common elements across the good ones, which even show up in the bad ones, usually being the better moments in those films. I'm not saying that the inclusion of these ideas guarantees a good Superman film, but hopefully something good may come out of the right combination. Superman can do pretty much anything he has to do, physically. If the bad guy can be punched into submission or thrown into the sun, then there's no real conflict or threat in the film. In Superman Vs The Elite, there is a moment where it really looks like Manchester Black and company may have beaten the Man of Steel into submission. It only lasts a moment, but the apprehension really engages and makes the climax all the more satisfying. 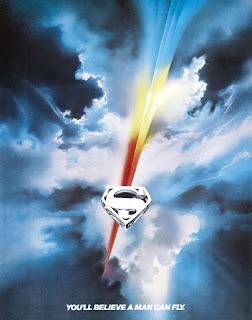 Superman needs to do more than fly up and punch something to engage the audience, the ending of Superman The Movie actually does this well, but the whole time-travel thing lets it down a bit. I like the work of Hanz Zimmer. I own a few of his albums and think he was a great fit for the Nolan Batman franchise. But seriously, why the hell was he brought onto Man of Steel? Williams' Superman Theme is one of the finest pieces of soundtrack work ever and even the Lego video games recognise this and work with it. I'm not ashamed to admit that when the brass starts up, a chill goes up my spine, even in the bad films. A great theme, forever tied into the character, why the hell would anyone not use it? Somewhere along the way, Superman lost the sense of wonder that used to hang around him. Superman Returns tried to bring this back, but fell short somewhere. In this age of cheap and nasty CGI effects, seeing a man hanging in the air just isn't that impressive; but it really needs to be. Superman needs to evoke a sense of childlike wonder in adults, and to do that, he needs to be the adult take on Peter Pan, just hanging in the air in the way every child has ever wanted to do. Everyone in the world knows that Superman is the "Man of Steel". Seriously, most people in developed nations can name at least three of his super powers, so why keep harping on them? What good Superman comics do is show that Supes is the man that we aspire to be, the man that we all could be if we were a bit less selfish and put the greater good before our own. The original film did this so very well, but a new balance needs to be struck in the postmodern cynicism of the 21st century. Christopher Reeve was the perfect cast for Superman and every new take will be unfairly compared against him. That said, try harder than Henry Cavill dammit. He needs to be Clark Cent in one moment and Superman in the next, so cast wide and make sure he's locked down before you cast anyone else. Seriously, stop trying to make Superman flying Jesus. For starters, he's an analogue of the European Jewish migration story, so the theological influence is clearly Moses, not Jesus. Superman is not here to save us from ourselves or die for our sins, he's here to show us what we can be. He is the prophet, not the messiah. That's right, Superman has more in common with Mohamed if we're sticking to the Abrahamic monotheistic faiths as exemplar. It may honestly be better to discard the entire symbolism here and focus on the "Man of Tomorrow" factor as mentioned above. 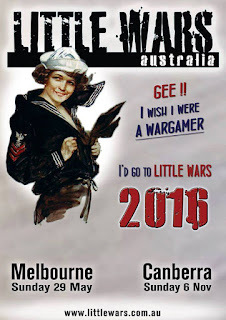 Well, that's my take, for what it's worth, what's yours? Long for the return of the Donner/Reeve combo or prefer the bloodthirsty Snyder smash? An interesting element of dating when you're a nerd are some of the "getting to know you questions" that every couple goes through. A popular one, from my experience, is "What superhero would you be?" (for the record, I pick Doctor Doom, or Hawkeye if forced to pick an actual 'hero'). One, rather memorable, encounter had the lady in question answer with Mystique, the shape-shifting X-Men villain. Her explanation of admiring Mystique for being empowered, self-determined, complex and endlessly adaptable won me over and stuck in my memory as much as anything else that happened in my bed that night. Since then, I've been keen to look at anything that features Mystique as a central character, to try and get a feel for her beyond what Hollywood has presented in the nebulous X-Men cinema canon. Unfortunately, Get Mystique is not so much a story that deepens Mystique as a character, but is yet more background padding for Wolverine. Yeah, turns out that Mystique and Logan dated/worked together in the 1920s running a gang of grifters. Why? Because every comic writer wants to put their name next to a major piece of canon and Wolverine still has a few decades of "blank space" left. The framing narrative is that Wolverine is tasked by, the slowly turning into emo Magneto, Cyclops to go kill Mystique because she betrayed the X-Men for the millionth time and someone at Marvel greenlit this trash. Logan chases Raven through the Middle East, dealing with the fallout of the couple of clever times she uses her powers well and being typically gruff and grim. In the climax, Mystique, for no apparent reason other than it being the final issue, grabs a bunch of guns and strips naked to fight Logan to the death. There was the possibility of a good story here, which is what makes it all the more disappointing. There is a huge opportunity for the exploration of the themes of duality and becoming what one hates here. Both Logan and Mystique are characters lacking their own identity. To cope, Logan has taken on the identities that others have given him; soldier, assassin, samurai, X-man. Mystique, in contrast, steals the identities of those people who she needs at the time, be they wealthy, powerful, innocuous or sexual. 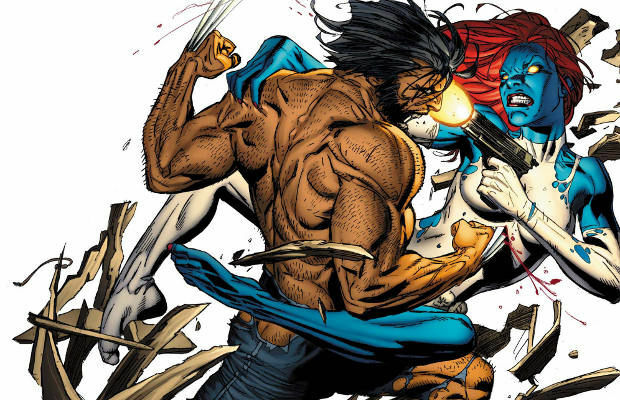 A story in which Logan was forced to track Mystique's trail, discovering the identities that she has adopted and discarded and seeing reflections of his own past, closing in before letting her go in a moment of empathetic ennui, would have been a real moment of character for the Wolverine. But we couldn't have that now, could we? With Little Wars Melbourne only days away, I've finished all my terrain, well, almost. Foo Dog! Makes the little park under the monorail a little more "Melbourne". Got some new Sarissa floors for my old tenements. I had one for each building, but because I painted them years ago, I can match the paints and need to do them from scratch. Still, two extra floors will make things look a bit better anyway. Although I've never been one to have the nostalgia goggles strapped on so tight as to cut off the blood to my brain, I was legitimately worried when I heard that Danger Mouse was getting a reboot. Danger Mouse is one of the few programmes that I have not found to be greatly diminished as I've aged. 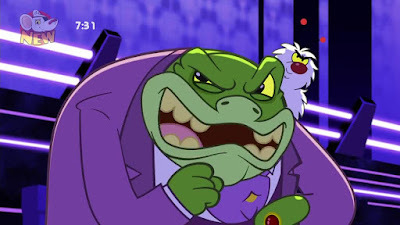 In fact, there is much more to enjoy in the classic Danger Mouse as I get older and appreciate references to Hammer Horror Doctor Who and The Avengers (the British one) for the first time. As soon as I found out who was in the new Danger Mouse, all concerns faded; Alexander Armstrong as DM, Kevin Eldon as Penfold and Stephen Fry Colonel K (also Brian Blessed as Father Christmas in a couple of episodes). There are changes, yes, which we'll get to below, but for the most part, Danger Mouse is just another season in a long-running franchise. How does it fare? Pretty damn well. Apart from updated animation and pop-culture references, it's pretty much the same programme. There are a couple of changes, like DM inhabiting a world of anthropomorphic animals rather than the human word, so he's living in a giant postbox rather than a normal-sized one; but I wonder if that was a choice to avoid confusing an audience that will be unfamiliar with the premise? That one, niggling, complaint aside, Danger Mouse is a fun ride from start to finish, with classic and new villains, flashbacks to episodes older than I am and more than one appearance of Count Duckula. The episode where the villain is a trivia-quoting DM fanboy is priceless, if a little insulting. Although nerds are always quick to cry "reboot", as if it's a racial epithet, that's not what this is. 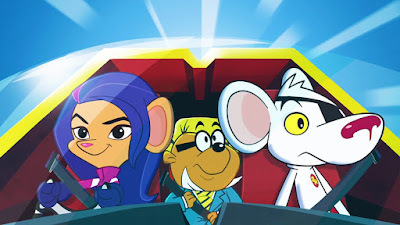 Danger Mouse is not a new series, devoid of continuity, but is a new series after a long hiatus. Hopefully, a new generation of nerds will be asking their parents who Duckula is and they'll soon find their way to Avenger Penguins. What? Kids need to appreciate the classics, not all this angry birds and Bay turtles crap.